This case study describes a risk assessment conducted for an international food processing company. Its purpose was to help the company make strategic decisions about the effects of climate change on its operations. It also provided guidance on how the company might act to preserve, and where possible enhance, the value of its business. A risk management process aligned with ISO 31000 was used. It was tailored for the specific context of climate change by using scenarios and climate-change drivers to structure the risk assessment. The case demonstrates the value of sound preparation, comprehensive briefing material and good facilitation for risk assessment and treatment activities associated with long-term risks and environmental uncertainty. Sea level rise and higher storm surges. The company was already doing what it could to contribute to the mitigation of climate change, primarily by reducing greenhouse gas (GHG) emissions through energy efficiency and other measures. The work described here was concerned principally with adaptation of the business to climate changes that were already developing and could be expected to grow, no matter what steps were taken in Australia or internationally to minimise GHG emissions. However, when examining climate change risks it was important that the company also considered risks to its business arising from responses by others to climate change arising nationally and internationally. Developing and implementing treatments and actions to deal with the risks. The preparation stage (establishing the context) was conducted prior to the workshop and the results were distributed to participants before the event. Risk assessment (identifying, analysing and evaluating the risks) was the main focus of the workshop. Treatment was considered following the initial risk analysis and outline treatment strategies or references to existing actions that could be expected to address the risks were noted. It is important to emphasise that the entire process – preparation, risk assessment and risk treatment – must be implemented for the benefits of the process to be realised. The overall climate change risk management process and the relationship between initial screening and later detailed analysis, where it is required, are illustrated in Figure 2. The initial workshop described here represents the top row in Figure 2 culminating in an initial decision about action to be taken in relation to each risk. The consequences of climate change extend beyond environmental issues. Climate change stimulates regulatory and legislative action and colours community attitudes towards government policy and the social acceptability of business practices. In principle, climate change can affect any part of a business. The approach set out by the Australian Greenhouse Office in Climate Change Impacts and Risk Management: A Guide for Business and Government (2006) is designed to deal with this broad scope. As far as possible, the process used in this case drew on the company’s risk management framework as it applied to operational and environmental risks within the company. The risk management context sets out a framework within which to identify and analyse risks associated with the impacts of climate change. It places the assessment on a clear foundation so that everyone works from a common understanding of the scope of the assessment, how risks are to be rated and how the analysis is to be approached. The framework was consistent with the general risk management framework being used in other risk management activities within the company. Scope – establishes the scope of the assessment including activities to be covered, geographic boundaries and the time horizon. Stakeholders – sets out whose views need to be taken into account, who can contribute to the analysis and who needs to know its outcomes. Evaluation framework – defines how risks will be evaluated by clarifying the objectives and success criteria for the organisation and establishing scales for measuring consequences, likelihoods and risk priorities. 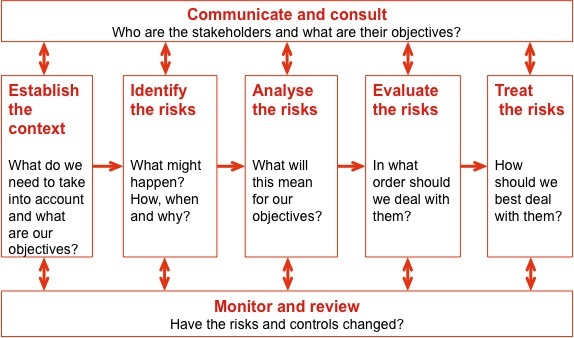 Key elements – creates a framework that will assist in identifying risks by breaking down the organisation’s concerns into a number of areas of focus and relating them to the climate scenarios. Climate change scenarios – describes how the climate could change in the future. The participants in a climate change risk management exercise must have a common view of all these matters for the exercise to operate efficiently, be repeatable across the business and from one review to the next as well as for the outputs to be communicated clearly to others. 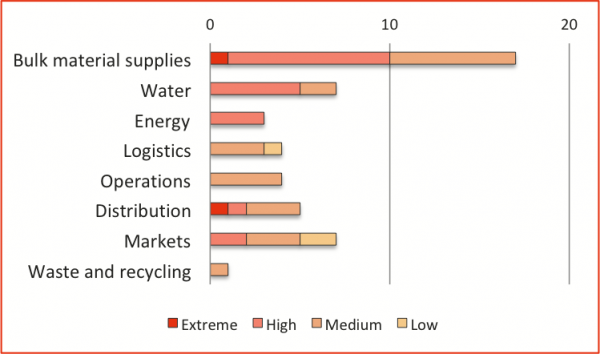 The climate change risk analysis considered all the company’s operations in Australia and New Zealand, including supply chains that drew on overseas sources, and distribution and sales within Australia and New Zealand. All stages in the supply chain leading into and flowing from the company’s core activities were included. The analysis considered any factors that were linked to climate change and could affect the success of the business. Environmental protection and sustainability formed an important part of the analysis. However, climate change will have far reaching implications for many aspects of human activity, agriculture, transport, industry and society, so it was not confined to these traditional areas of environmental concern. The analysis covered a 20-year time horizon. This was extended to include decisions taken in that timeframe that would have longer-term implications for the business. Environmental pressure groups, social action and other special interest groups. The consequences of a risk are measured by the extent to which it might affect the success of the business. High-level criteria for encapsulating the long-term success of the company were included in the company’s corporate risk management framework. These were extended in this case to facilitate the risk analysis stage of the climate change risk assessment. To enable the participants to describe priorities reliably, without undue delay in the workshop, a set of scales was prepared that defined levels of consequence, likelihood and priority. This is a proven approach, which is used widely in risk management processes based on ISO 31000. Risks were rated for a given climate change scenario based on the criterion against which the most severe impact would be felt. Table 1 was developed to provide a way of rating the likelihood of a risk, given the climate change scenario being considered. One column in Table 1 is for recurrent events, such as episodes of extreme weather, while the other is for events that can only happen once, such as the permanent loss of a geographical region to agriculture or a societal shift against particular uses of natural resources. Table 2 and Table 3 show how initial priority ratings were assigned based on the consequence and likelihood ratings chosen for a risk. Since the initial rating was based on the assumption that a climate scenario would arise, the outcomes were adjusted later to reflect the fact that some climate scenarios are more likely than others. It should be noted that immediate action might mean no more than a commitment to further examination of an issue in the first instance. At the very least, it might be expected that risks that have been rated among the most important facing the company would be documented as an aid to decision-making and to enable the business to explain its position on the issue if the need should arise. The key elements are not intended to restrict the exercise, nor are they necessarily risk categories. They are simply a prompt and a tool for managing time in the assessment. It may be that, upon reflection after the risk assessment, it proves useful to arrange risks into groups for presentation, further analysis and planning purposes; those groups might have little relationship to the key elements. The key elements were used with the additional prompts shown in Table 4. 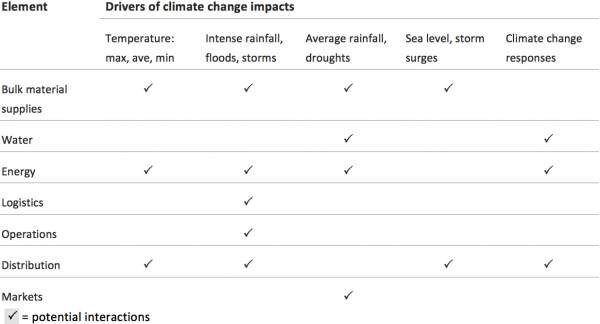 This matrix links key elements to major drivers of climate impacts (both physical drivers and response drivers). It provides a general indication of the aspects of climate change that have the potential to pose significant risks to the company’s operations. To manage the risks of climate change it is necessary to define how climate is assumed to change in the future. This is achieved most effectively by using scenarios that encapsulate the major changes the business can be expected to face. The climate change scenario outlined in Table 5 provides a summary of the changes to climate features that could occur by 2030 relative to 1990, for eastern and southern Australia. The scenario draws on projections that were prepared by Hennessy et al (2006). The use of 2030 as the reference date means that a time horizon of approximately 15 years hence was used for the risk assessment. This was the earliest date for which reliable projections of changes to climate variables were available. It should be viewed as a reference period, rather than as a single point in time. The scenario covers projected climate changes in the eastern, south eastern and south western regions of Australia, where most of the company’s Australian operations were based and most of its preferred and alternate suppliers were located. The scenario was based on assumed increases in average temperatures but a decrease in average annual rainfall, reflecting recent trends and current climate models. It was recommended that this scenario be used in relation to all the company’s Australian operations. It was important to remember that changes indicated in the scenario would not necessary occur smoothly over time. Past evidence indicates that changes to some climate variables, notably annual average and seasonal average rainfall, can be abrupt. Note: In the table, drought is defined as a serious rainfall deficiency (in the lowest 10% on record) for 3 months or more. Drought frequency varies from region to region but, on average, most areas in eastern and southern Australia experienced about 3 droughts per decade from 1961 to 2000. The workshops were in two main parts: one to identify and analyse risks, the other to start exploring treatments or adaptation actions that could be taken to address the risks. Taking account of those controls, assigning a consequence rating and a likelihood rating from Table 1. An initial priority rating was assigned from Table 2 based on the consequence and likelihood ratings. When one key element had been completed, the workshop moved on to the next one until they had all been considered. Following the risk identification and analysis, the workshop team reviewed the risks to ensure the ratings had been consistent throughout the day. The outcome of this review was a set of risks with agreed priorities. Taking the highest priority risks, the workshop then considered risk treatment planning. Outline treatments or existing business activities that might address each of the most severe risks were identified as a foundation for continuing risk management. In all, 45 risks were identified and rated. 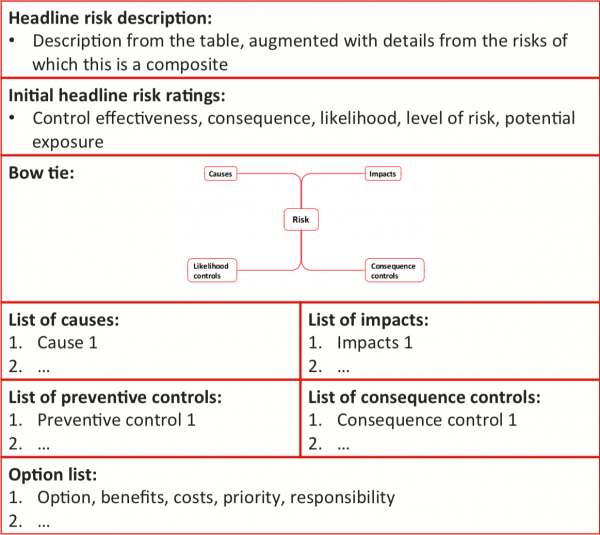 The distribution of risks and their consequence and likelihood ratings is shown in Table 6; the profile across key elements is shown in Figure 3. Eight risks were assessed as being more than likely to occur or already in place. They were treated as planning assumptions rather than risks. Distribution costs increase as fuel prices rise. Similar or related risks were grouped into ‘headline’ risks to simplify the development of treatment and adaptation options. Some risks were already being addressed by the business. Material from the risk assessment was referred to the relevant teams to augment their own work. Options were developed and analysed for the other important risks, using a template like the one in Table 7. No – the costs clearly exceed the benefits and so this is not worth pursuing further. Climate change refers to matters that are uncertain, and particular climate outcomes may not arise until some time in the distant future. A risk assessment in these circumstances is different from one associated with the immediate or short-term consequences of risks that might arise soon. Participants in a climate-related risk assessment need additional help, and a detailed briefing note, to help them think clearly about what might happen under circumstances that are quite different from those they currently know and understand. This case used the extended key element arrangement in Table 4 to structure risk identification, combining business-related elements with drivers of climate change. The drivers were themselves linked to climate scenarios that encouraged workshop participants to imagine what the future might look like and so help them to identify risks. Scenarios like the one in Table 5 are based on the best available science, applied to the particular geographic area and future timeframe of interest. While the scenarios might be based on sound scientific analysis, they have to be interpreted very generally, not as a specific set of climate outcomes at a particular time in the future. They are a point of reference, from which workshop participants can think broadly about what might happen and the implications for business outcomes. 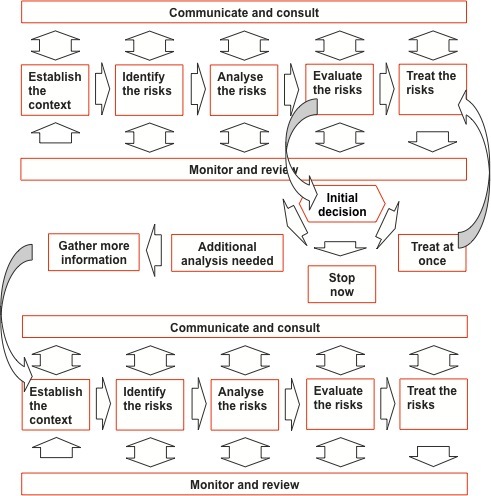 Figure 2 showed a two-stage risk management process that is useful for climate-related work (and also for many environmental risk assessments). The first phase is a screening process, to identify the most important risks. Where necessary, a second phase delves into more detail, often after collecting appropriate additional information, but only where the additional analysis is useful as an aid to making better decisions. In this case we only undertook the initial screening, as this turned out to be sufficient at the time. Climate change risks may not have consequences for the business until the distant future. Compared to risk assessments relating to immediate or short-term matters, the analysis of treatment options may identify activities that are worthwhile but do not need to be undertaken immediately. Activities may be contingent on specific thresholds being reached, or specific trigger events arising. Developing a good set of treatment options, and the circumstances that might lead to a decision to start their implementation, may require more imaginative thinking than for treating short-term risks. Successfully identifying and analysing climate-related risks, and developing relevant treatment options, all require workshop participants to exercise their imagination. This must be a structured activity, to ensure it is relevant, but the structure must encourage extrapolative, non-linear and ‘outside-the-box’ thinking. Several factors support this. A good set of key elements, linked to drivers of change, provides a solid structure within which to work, without constraining participants too much. Soundly based scenarios allow participants to visualise possible futures with which they may not be familiar. For climate change, such scenarios have been developed and published for many parts of the world by reputable government agencies and scientific organisations. As with many scenario-based processes, having descriptions of several possible futures available to stimulate discussion is worthwhile. For example, a generally beneficial or ‘good’ scenario and a less-favourable or ‘bad’ scenario may be used to extend the range of the discussion and the risks that are identified. Good briefing material is essential. It must be issued well in advance, so participants have a chance to read it and think about it in detail before they come to a workshop, and it must be comprehensive, to encourage participants to think broadly about what might be discussed in the workshop. Finally, good facilitation is very important. The facilitator must be able to work within a structure of elements and drivers like that in Table 5 to ensure everything important is covered, but in a loose enough way to encourage useful discussion and debate. This is not an easy task, as there can be a fine line between genuinely imaginative thinking and irrelevant diversions. The facilitator must be very well-prepared too if this balancing act is to be maintained throughout a workshop process. Australian Greenhouse Office (2006) Climate Change Impacts and Risk Management: A Guide for Business and Government. Australian Government, Department of Environment and Heritage. Hennessy, K, Macadam, I and Whetton, P, 2006. Climate change scenarios for initial assessment of risk in accordance with risk management guidance, Prepared for the Australian Greenhouse Office, Department of the Environment and Heritage, CSIRO Marine and Atmospheric Research.